Lake Nipigon is the top destination in Ontario if you want to experience the thrill of catching a World Class Monster Lake Trout. You could go to the Arctic or the Yukon and spend $6500 US or more and catch the same size fish that you can catch in Lake Nipigon but you just don’t need to spend that kind of money. 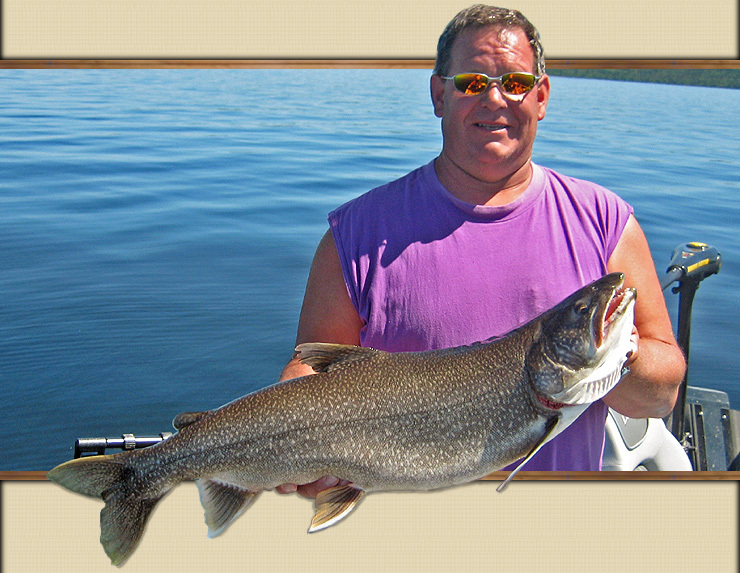 The difference is the accommodations at Pasha Lake Cabins are a fraction of the price, considerably more comfortable and you have the opportunity to catch many other species of gamefish including Northern Pike, Walleye, Brook Trout, Splake, Perch and Whitefish. The outcroppings of Canadian Shield Rock, framed with towering pine trees, is a much more beautiful and sole-soothing environment than a barren and lifeless arctic tundra. Remember, you are on your vacation so relaxation and a calm state-of-mind is just as important as fishing. Lake Trout in Lake Nipigon have an astonishing average size of 20 pounds with many being caught and released during the summer that range between 30 and 40 pounds. On occasion Lake Trout in the 45-pound class get caught. The record Lake Trout for Lake Nipigon was just over 62 pounds, and just under the Ontario record by a few ounces, which was caught in Lake Superior. The MNR netted a Lake Trout over 64 pounds in Lake Nipigon while conducting a Lake Trout population study in 2007. Whether you are in our jet boat, a fishing charter boat that we have arranged for you or using your own boat, you have a great chance at catching these monsters. 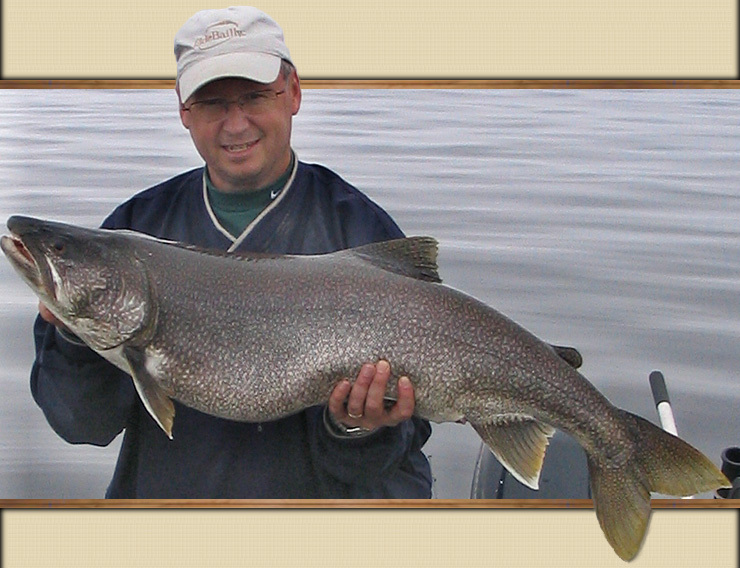 An expected afternoon of Lake Trout fishing usually produces between 2 and 7 fish. Then there are the really good days when you catch more. With the average size being 20 pounds, you can feel free to have the expectations of catching a really big fish. Just after ice-out, the Lake Trout are just under the surface. At this time they can be caught casting with casting spoons or trolling with shallow running lures. You can actually locate the trout by watching for trout chasing minnows on the surface. You will see their dorsal fins slicing through the surface like fresh-water sharks as the minnows jump into the air in panic. As the sun gets more intense and the surface water starts to warm up, the trout will start to go a little deeper but generally they will stay fairly shallow and not go deeper than 20 feet until the second or third week in June. They may go deeper in the middle of the afternoon if it’s really sunny. At this time deeper running trolling lures or casting heavy Cleos, Mepps Syclopses or Krocodiles will get them. They generally stay shallow while waiting for the May Flies to hatch in June. Once the May Flies hatch, they gorge themselves on flies. At this time the fishing is slow but it only last for a couple of days. Once the hatch is over, Lake Trout start to move deeper. By the end of June they are usually 25 to 45 feet deep. This is a transition period when they are spread out at multiple depths so you have to try different techniques. In the middle of the summer, you would expect this to be a hard time to catch them. 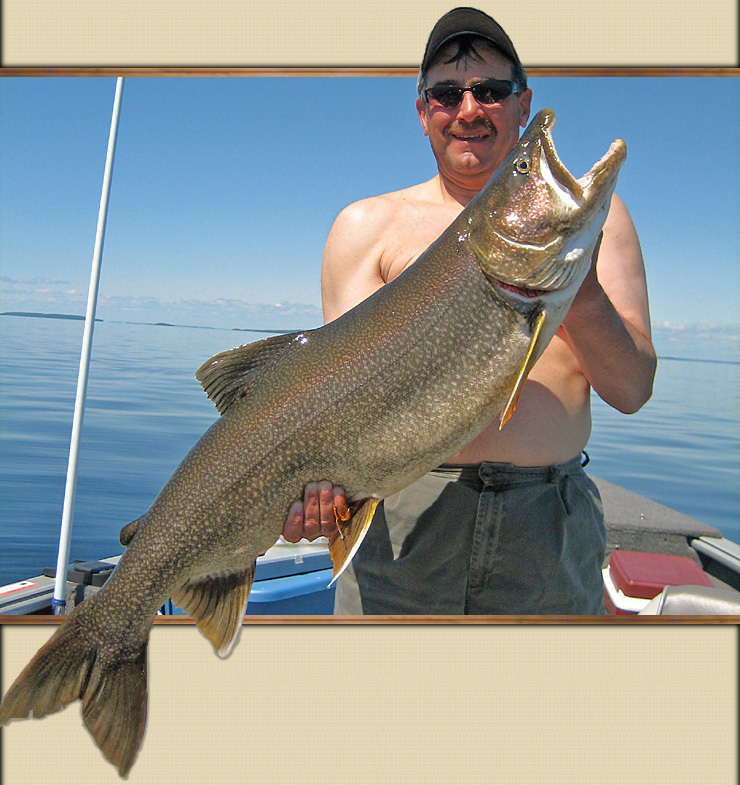 In actual fact, the Lake Nipigon thermocline is usually around 65 to 70 feet deep in mid-summer and the Lake Trout are concentrated just above the thermocline. If you have a small boat that trolls slowly, you can catch them using our 3-way swivel technique. If you are in a bigger boat or you have asks us to arrange a charter boat for you, downriggers are usually used. We have to warn you. People that fish for Lake Trout and catch Lake Trout usually become fanatics. There is no bigger thrill in fishing than bringing up a monster fish from the deep. You can feel its weight. You try to picture the fish in your mind fighting while line is screaming off your reel. The end result is a fish that just might be the biggest fish you have ever caught. There are no fishing camps on Lake Nipigon. Vacationing at Pasha Lake Cabins and taking day-trips to Lake Nipigon is the most advantageous plan you can make. If the weather turns bad, you can still have a productive day of fishing on the lakes surrounding Pasha Lake instead of sitting in a hotel room in town waiting for the charter boat to give you the ok. Our inland Lake Trout Lakes have lots of good size trout and your chances of catching a small good-eating size trout are better because most trout you catch on Lake Nipigon are huge.